His Holiness the Dalai Lama with Lama Zopa Rinpoche and the abbot of Sera Je, Khenrinpoche Geshe Lobsang Delek, Sera Je Monastery, India, December 2013. Book Your New Interpreter Now! Grants Available to Offer the Liberation Prison Program at Your Center! Lama Zopa Rinpoche thanking benefactors for their very kind and generous donations to the Sera Je Food Fund, Sera Je Monastery, India, January 2014. 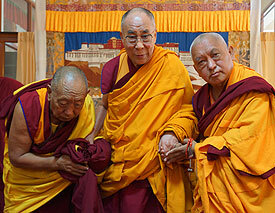 Lama Zopa Rinpoche had a private audience with His Holiness the Dalai Lama in Sera Je Monastery on January 2, 2014. Ven. Roger Kunsang shares that during the interview, His Holiness highly praised the three great monasteries (Sera, Ganden and Drepung) for their learning and for preserving the teachings of the Buddha in their entirety. Then His Holiness said that even the Buddha had to eat so that he could teach, and it was the same with the great Indian pandits – they needed to eat in order to be able to teach others. The monks need to rely on food in order to be educated in these great establishments of learning and His Holiness said that this is why the food fund that Lama Zopa Rinpoche and FPMT has established and offered for many years [the Sera Je Food Fund] is so very important. The abbot of Sera Je Monastery then said to His Holiness that Rinpoche has been looking after the food for the monastery for more than 20 years, which has made a big difference to the monastery, and really changed life at Sera Je. After the food fund was established and food was free and of better quality, many more monks were able to stay and study and benefit from the excellent Dharma education at Sera Je. Rinpoche also helps a lot with education at Sera Je in many ways by providing for the needs of many individual monks and also helping khamtsens and labrangs. The abbot added that Rinpoche and FPMT also helps all three great monasteries as well as Gyuto and Gyume, Tashi Lhunpo and Rato for their educational needs, the Gelug exams, annual winter debate expenses and so on. His Holiness was very happy with the help which Rinpoche and FPMT have been able to provide. If you missed Ven. 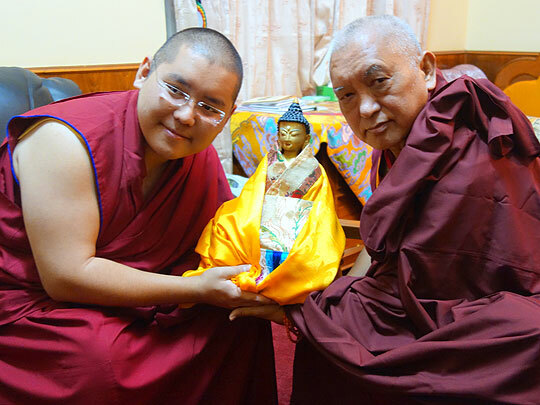 Roger Kunsang’s recent update on Lama Zopa Rinpoche’s health, you can read it now. The Indian postal service was able to create a commemorative envelope of the Maitreya Project coming to Kushinagar. 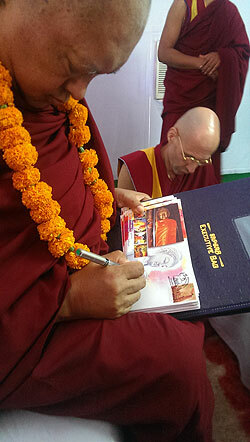 Lama Zopa Rinpoche signs a small stack as collector’s items, Kushinagar, India, December 2013. Lama Zopa Rinpoche recorded the following conversation with a student directly on his iPad in November 2013. The student was sharing the news that gold was being offered to the spire of the Mahabodhi Temple in Bodhgaya, and Rinpoche was telling the student to rejoice, as jealousy only causes suffering, not happiness. “Tell people this: hell, enlightenment, samsara, nirvana, every day happiness and suffering, come from one’s own mind. Thinking this way leads to hell, thinking that way leads to enlightenment. Every day happiness and suffering as well as samsara and nirvana all depend upon what concept we generate. So therefore, it becomes so important to always generate positive concepts, positive ways of thinking. This is Dharma practice. Use particular unfavorable conditions that you experience to think that you are finishing the result of past negative karma and then use that on the path to enlightenment, use that in the practice of bodhichitta. Experience the problems, sickness for other sentient beings in order to free sentient beings from suffering, from the cause of suffering and enable them to achieve the dharmakaya. His Holiness praises Ven. Roger Kunsang, Lama Zopa Rinpoche’s assistant and CEO of FPMT Inc., Sera Je Monastery, India, January 2014. Tara Melwani was present at the private audience between His Holiness the Dalai Lama and Lama Zopa Rinpoche in Sera Je Monastery on January 2, 1014 and shares that His Holiness praised Ven. Roger Kunsang, thanking him and saying how much he appreciates Ven. Roger’s long-time devotion towards Rinpoche. Ven. Roger is Rinpoche’s assistant and the CEO of FPMT, Inc.
Ven. Tsering holding an example of his work, January 2010. Read more of the interview with Ven. Tsering or learn more about the Prajnaparamita Project which provides the material resources needed for Ven. Tsering’s work to continue. Did you know that every issue of Mandala offers new stories and teachings online to supplement our print edition? As part of our new January-March 2014 online edition, we highlight videos and photos from FPMT Mongolia and the 100 Million Mani Retreat. Plus don’t miss our new interview with Buddhist scholar John Dunne on mindfulness, our gallery of Tendil Nyersel prayer flags flying at FPMT centers, projects and services worldwide and a video introduction to Geshe Gelek Chodha, the resident geshe at Kadampa Center in Raleigh, North Carolina, US. Visit “this issue” at fpmt.org/mandala for these stories and much more! Please plan to join Lama Zopa Rinpoche and your FPMT family for this essential FPMT meeting, CPMT, which will be held September 13-19 in the unique and awe-inspiring location of the Great Stupa of Universal Compassion in Bendigo, Australia. Our last CPMT meeting was back in September 2009, so there are many significant developments and news in the organization since then to share and discuss. The theme of CPMT 2014 is Preserving the Dharma Now and Into the Future: What That Means for Us. Preserving the Dharma Now and Into the Future includes studying and actualizing the path; and organizational development, the vehicle for this work. The agenda and registration information will be coming to you very soon! 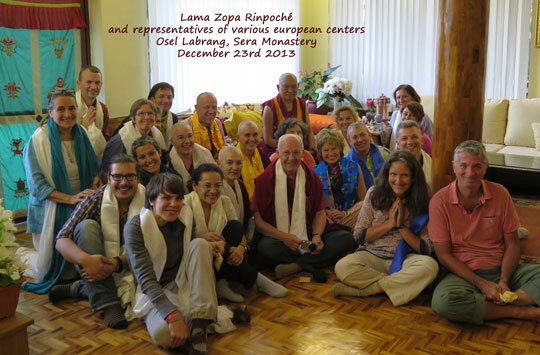 Lama Zopa Rinpoche met with representatives from various FPMT centers, projects and services in Europe while in Sera Je Monastery, India, December 2013. Photo courtesy of Institut Vajra Yogini. The new edition of Basic Program Guidelines for Implementation, entirely updated and revised, is now available online. The online BP Guidelines (FPMT Affiliates Area log-in required) is fully indexed, making it easy to find and access the specific advice you need for your Basic Program. Please explore. PLEASE NOTE! The Basic Program CD is no longer in use, and the old edition BPGuidelines2006 that was included on the CD should no longer be used. “Lotsawa Rinchen Zangpo Translator Programme Number 6 (LRZTP6) is over half way through and will have several new interpreters (lotsawas) ready to take up apprenticeships with the resident geshe at your center at the end of 2014! Please consider your interpreter requirements carefully now. We currently anticipate that at least five apprentice interpreters will be available for placement in an FPMT center at the end of the course! They offer these languages: English, Russian, Hebrew, Spanish and Japanese. Three further students are already committed to centers. Contact me now to discuss the possibility of your center booking one of these students now. Prison Program at Your Center! Liberation Prison Project has been offered funding from a generous donor to assist FPMT centers around the world offer the Liberation Prison Program as part of their community service programs. Centers who are considering implementing the Liberation Prison Program locally or who are already offering the Liberation Prison Program and want to develop their services further, are encouraged to apply for a small grant. The grant application deadline is February 28, 2014. Read more here. Thanks to those who have already advertised their retreat schedule – and a reminder to all FPMT centers that we are happy to include your retreats on our Retreat Schedule webpages! For Discovering Buddhism retreats, contact Tom Truty. For all other retreats four days or longer, contact Claire Isitt. His Holiness Ling Rinpoche offering a statue to Lama Zopa Rinpoche during His Holiness the Dalai Lama’s Jangchub Lam-rim teachings, which were organized by His Holiness Ling Rinpoche. Sera Je Monastery, India, January 2014. The Foundation for Developing Compassion and Wisdom is looking for a new director; as is Ocean of Compassion (Gyalwa Gyatso) Center, USA; Root Institute, India and Chenrezig Institute, Australia both need a spiritual program coordinator (Root also has other volunteer opportunities); Mahamudra Centre, New Zealand urgently needs a center manager. Please include Deidre Frank, the director of the Tsa Tsa Studio, USA who passed away on January 1, in your prayers.